Today’s World of Tanks update brings a host of Italian tanks, with modern models bringing a brand-new autoreloader mechanic for rapid destructive response to enemy threats. 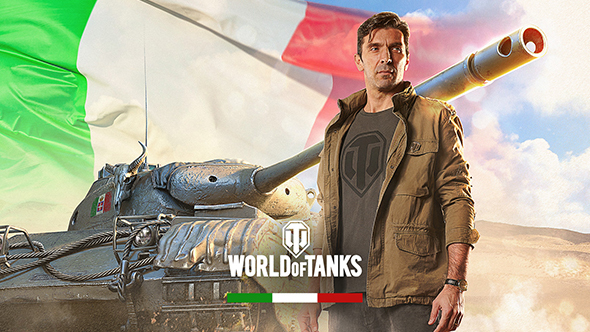 Italian tanks need Italian captains, and to that end developers Wargaming have brought, uh, Juventus goalkeeper Gianluigi “Gigi” Buffon to the field. My colleagues have passed this football-related story to me, the American, a fabulous choice for all involved. Haven’t played in a while? Find out what’s new in World of Tanks 1.0. I’m told Buffon is “recognised by many as the greatest goalkeeper of the 21st century,” contributing to the new commercial above and joining the game itself as a tank commander. He’s providing both likeness and voiceover for the game, because you have to be sure to use all parts of the goalie. Anything else is a waste. “World of Tanks and football may seem a bit of an odd pairing—but trust me, it’s not,” says publishing director Anton Pankov. “Whether you’re 15 vs 15 in our game or 11 vs 11 in football, it’s all about teamwork. You need a good head on your shoulders because the right strategy and tactics are crucial to securing victory.” I dunno, Anton, still seems like a bit of a stretch, but I guess we’re going with it. The 11 new Italian vehicles start off with low-teir tanks that are small, lightly armoured, and fast, before moving up to mid-tier vehicles with better armour and firepower. At Tier VIII and up, we start to see those post-WWII designs, featuring autoreloaders with ever more impressive firepower, giving big considerations when engaging in mid and close range combat.